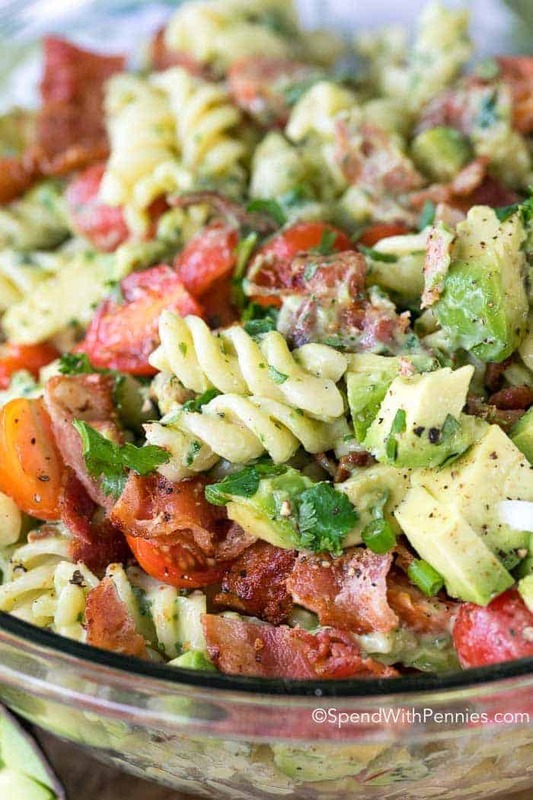 Avocado Pasta Salad is a rich, creamy and totally delicious pasta salad loaded with fresh juicy tomatoes, crisp bacon and creamy avocados. 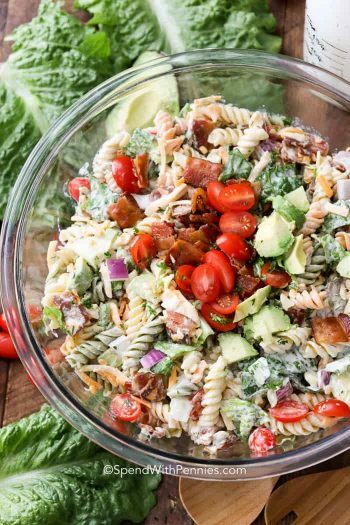 This pasta salad uses avocados in place of mayonnaise for a dressing that is rich and creamy yet loaded with the benefits of avocado! Avocados are pretty much one of my favorite things ever! They are healthy, rich and creamy! I add them to salads, spread them on crackers and eat avocado toast for breakfast at least a few times every week! I’ve been making Avocado Dressing & Dip forever… avocado is so velvety, it makes a perfect base for a dressing in place of mayonnaise! 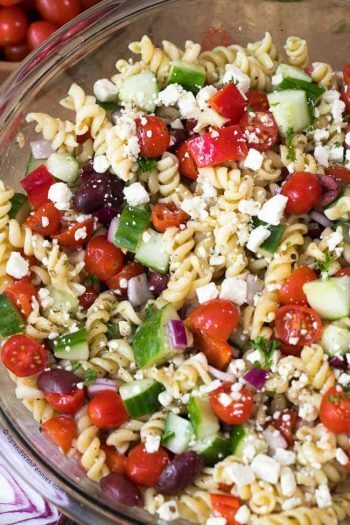 With summer here, I love meals that don’t require turning the oven on and cold pasta salads fit the bill perfectly. 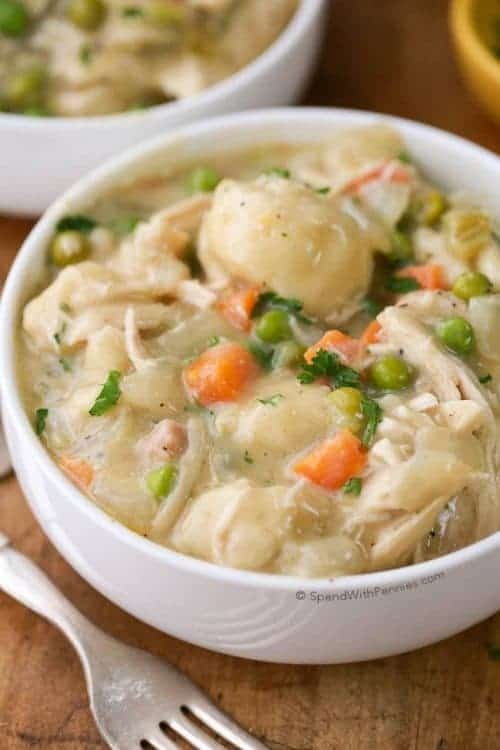 They can be prepped ahead of time and are the perfect well rounded meal (often with protein and veggies) and great feed the kids before we run out the door to soccer practice! Even better, the leftovers are always yummy meaning lunch tomorrow is already done if we’re lucky enough to have some left! This recipe marries my favorite avocado based dressing with the same ingredients I top my avocado toast with for the perfect flavor combination! 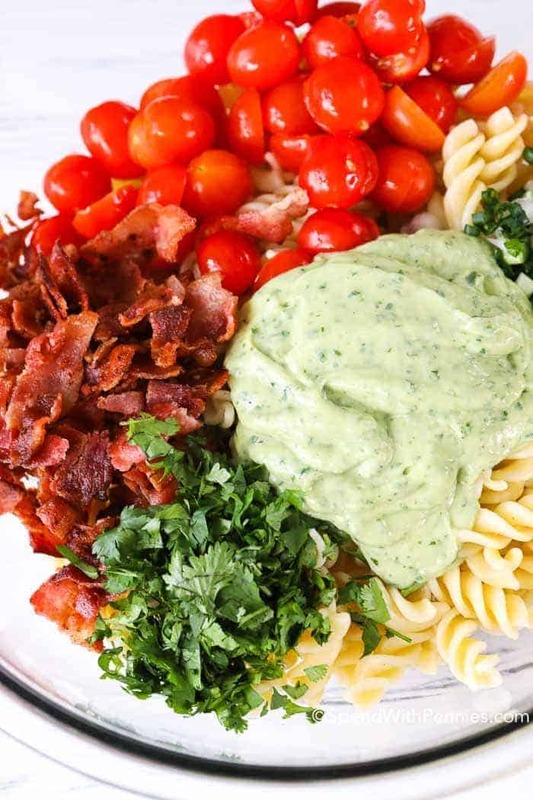 Juicy ripe tomatoes, crisp smoky bacon, fresh cilantro, a hint of green onion and deliciously creamy diced avocados! 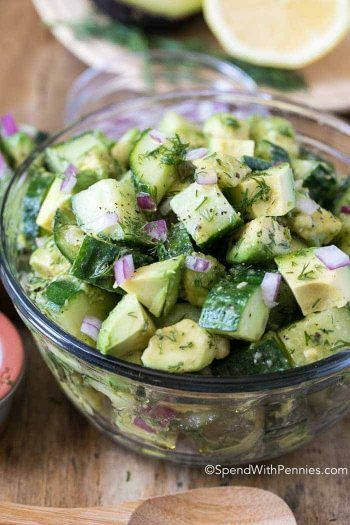 The very best part of this recipe is the luscious avocado dressing… full of flavor and silky smooth! To make this a main dish we sometimes add chopped grilled or rotisserie chicken. Avocados have a rich and creamy texture because they contain monounsaturated fat which is a good fat and can help lower cholesterol when eaten in moderation of course! Placing avocados in a paper bag with ripe bananas will help them ripen faster. (Due to the ethylene gas naturally released from the bananas). Once ripe, avocados will keep in the fridge for 4-6 days. When storing a cut avocado, brush the open edge with lemon or lime juice and wrap in plastic before refrigerating. 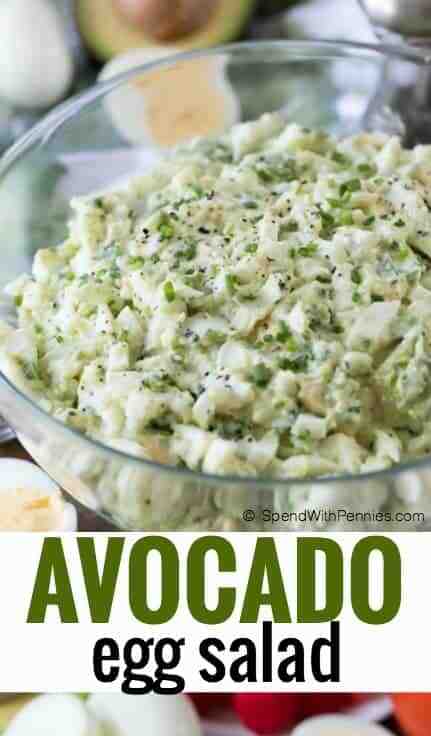 This will help keep avocado from browning as quickly. If you have too many ripe avocados, they can easily be frozen. Scoop out the green flesh and 1/2 tablespoon lemon juice per avocado. Puree in a blender or food processor and freeze in a freezer bag. Defrosted avocado is great in this recipe or for guacamole! The fats in avocados are great for your skin. Rub the empty peels on your elbows or heels before tossing to soak in some of the benefits of this delicious fruit! Like most pasta salads, I generally make this a few hours before serving. If you find the avocado dressing thickens too much add a little bit of buttermilk and give it a quick stir before serving. 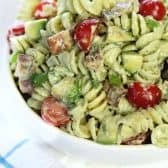 Although I enjoy the leftovers of this pasta salad for a couple of days, due to the nature of the avocados, this pasta salad is best made on the day it is served. 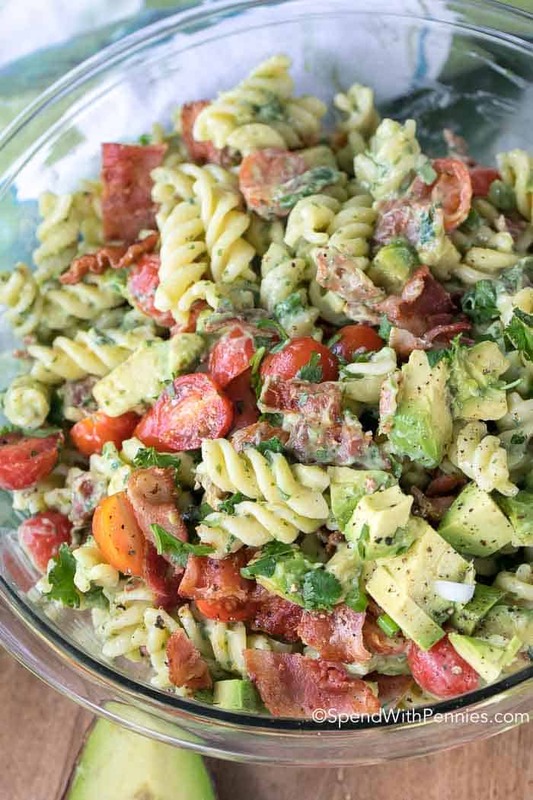 Avocado Pasta Salad is a rich, creamy and totally delicious pasta salad loaded with fresh juicy tomatoes, crisp bacon and creamy avocados. I love all your recipes, and salads is great here in Las Vegas great meals with the heat. Thank You Holly. Thank you so much Marie! Salads are always a favorite of mine too on hot days! Could I make this in the morning to serve that evening? I have made this before by the way and it’s amazing!! I am so glad you have enjoyed this recipe Heather! Hands down delicious!! I forgot to purchase the buttermilk and green onions. So, I put 1/2 TBSP vinegar in a measuring cup and filled the cup with milk to the 1/2 cup mark. Let it sit until I was ready to use it as my substitute. I also finely diced some onion (about 2 TBSP, I tried to stay to what I thought 1 green onion would equate to). Everything else was to the recipe. This was so amazingly good!!! Two men in my family who have never tried avocado were amazed and scarfed it up. Thank you so very much for sharing this beauty of a keeper. I am so glad you were able to make this recipe with what you had on hand and enjoy it Krista! This was so delicious that I made it two days in a row! Since the dressing is made out of avocados, I omitted from the salad. I didn’t have buttermilk on hand so I decided to go with a little mayo and vinegar. It’s super easy and a keeper!!! Thanks so much for a delicious recipe!!! 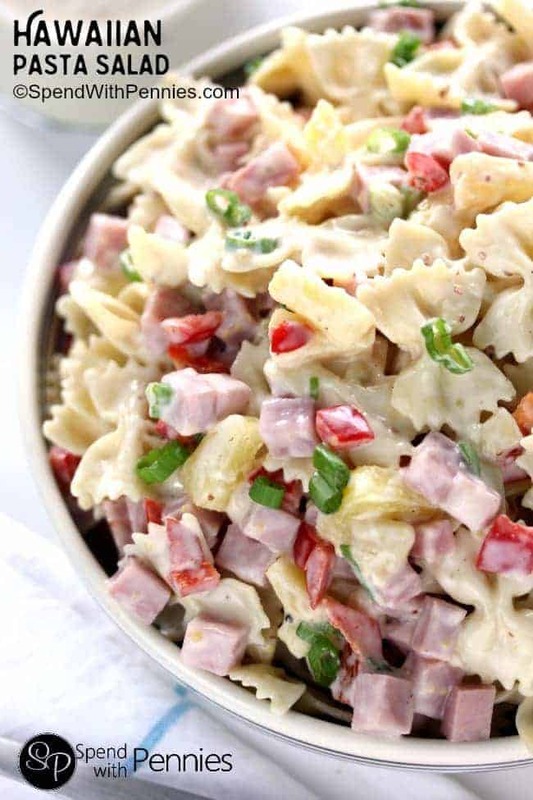 Gina, I am so glad you have enjoyed this pasta salad recipe! I have made this recipe twice. The first time for New Years Eve and everyone loved it. I just finish making a batch for my daughter per her request. Its so easy to do and delicious. Holly, all these are fantastic recipes – I will be making the pasta salad ASAP – great ingredients!!!! Thank you so much. That’s sounds so delish but I don’t care for buttermilk, how strong is the buttermilk flavor? It would be similar to what you would taste in a buttermilk ranch. If you don’t like that flavor, you could try a bit of milk and sour cream. Hi, I would love to make this recipe, but I don’t care for cilantro. Could you please suggest a different herb or spice, or would it change the flavor too much to simply omit the cilantro? Thank you! 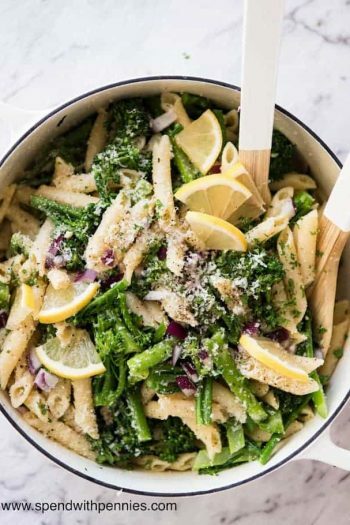 You could try parsley, it would change the flavor but still be delicious! Thank you, Holly, I will. I have made this recipe probably ten times at least!! 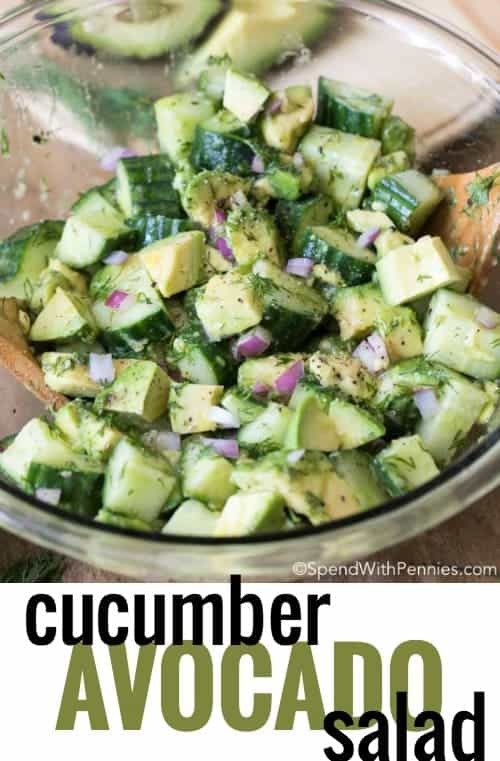 I love it so much and it’s a real crowd pleaser at any bbq or summer get together (not that I wouldn’t enjoy this year round!) My husband likes me to add chicken to it which is great as well- but not a necessity of course. How great to hear Kara! Love adding chicken. I think this sounds terrific. I’m on Weight Watchers, which makes avocado an “expensive” choice, because it’s nearly half my daily allotted points. I think that’s crap, because avocado is fantastic for you, and I plan to make this anyway, and adjust my points to something less irrational! I wonder if there is an error in the ingredients, or maybe I am being dumb. “1/2 lime, juiced” would seem to refer to the remains of a half lime after being juiced, correct? If so, then this makes the salad inedible due to the bitterness of the lime skin/pulp, not to mention chewy. Lime zest, I could understand but not the husk of the thing. Please clarify. I had to throw nearly all of it away. You require half a lime… and it should be juiced into the salad dresssing. You can discard the skin and pulp. I’m going to cook this. It looks delicious. Thanks for sharing! Shared this a while ago so that I could try it later. Today was later. It was wonderful! My husband lapped it up and barely had enough left over to serve with the dinner I was planning! So yummy! Thank you for sharing the recipe! Gonna try this pasta salad next time. My husband actually found this recipe and asked me to make it for him. Love it!! Thank you so much for sharing! You’re welcome! Great that he found it! And better that you loved it! Small error on recipe: cherry tomatoes are HALVED not diced. This looks delicious! That dressing especially. Yum. We have a bbq tomorrow with 16 friends and I definitely want to make this salad. Do you think that would be a nice addition or would it be to sweet? I can’t say for sure how melon would work in this recipe. If you do try it, please let us know how it worked out for you! This sounds so good! However my husband can’t have dairy anymore. What non dairy could I substitute for the buttermilk ? You could try coconut milk with 1/2 tablespoon of vinegar or lemon juice. I’ve never tried it, but it should work! Let me know how it turns out! Loved the recipe! I didn’t have buttermilk so I added a bit of lemon juice to regular milk, let it curdle (about 10 min.) and it worked perfectly! This will be our lunch today! All my favourite things in one dish. I may love you ;). Thanks! This was super delicious! I added chicken since I made it for dinner. Definitely will make it again. I made this tonight and it was amazing. I didn’t have any lime, so I used orange zest instead. So good. Thanks for sharing! That sounds like a great substitute! Glad to hear you enjoyed it! Delish!!! !..yuuuumm..is there a way to know how many caloríes? ?..per serving and the serving size??plzzzz!!!! thanks!!! Can I make this 1 day ahead of time? This recipe is best made the day of serving. The cover page ingredient list says coriander and does not list cilantro. The actual recipe does not call for coriander and does call for cilantro. Cilantro is also known as coriander in some locations so certain programs automatically change the wording. This recipe uses fresh cilantro. Because this recipe has fresh avocado it doesn’t keep very long. We’ve eaten it as many as two days after making. It does discolor slightly. Made this tonight. Loved it! Great instructions. Hubby loved it. Wants to make it every week. Some changes we made….no bacon, almond milk instead of buttermilk and added 1/4 of a red pepper. Thanks for a yummy supper! I’m glad your family enjoyed this! Thank you for sharing your substitutions for other readers that are looking for dairy free options! When you put it in the refrigerator for an hour is it supposed to be covered? Thanks. Yes, I would store it covered. I made the avocado bacon pasta dish. Not crazy about it. 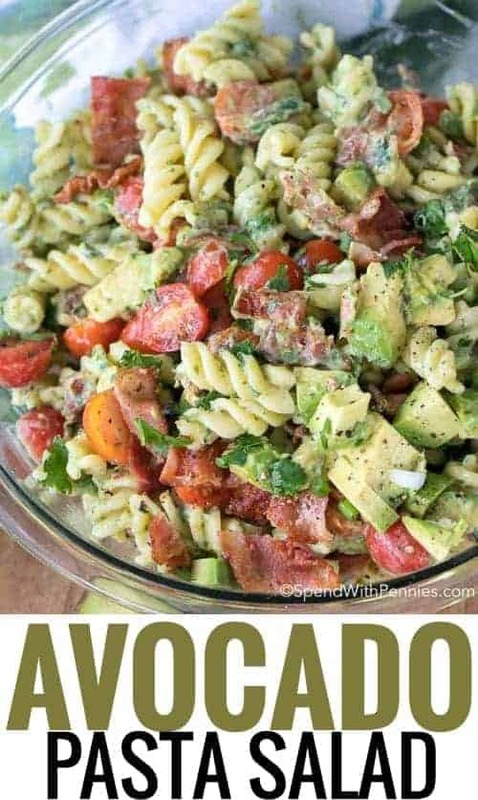 Makes A LOT and the avocado gets dark and the pasta is kinda chewy a day later. Eh. There’s better ways to use your daily calories. This looks divine and sounds amazing! Can’t wait to try! Yes, they are fine to be made one day ahead of time. I do prefer to make it the day I am serving if possible though. Thank you, we love this one! I hope you enjoy it! It is incredibly yummy!! This salad looks and sounds really delicious. My daughter is allergic to dairy products so I’d need to substitute the buttermilk for her, any suggestions? You could try a dairy substitute. I’m not very familiar with most dairy free products however buttermilk is a little bit thicker than some of the dairy free products so you might want to start with a little bit less liquid to get the right consistency. Mine was about the consistency of yogurt or sour cream. Hope that helps. 1 c. almond milk soured with 1 tbsp. lemon juice (let sit at least 15-20 min before using) works wonderfully as a dairy free buttermilk substitute! Thank you for sharing Sarah! I had no idea that would work with almond milk! U can use any dairy free milk, I used unsweetened coconut. Add 1 Tbs of either lemon juice or ACV to 1 cup of you milk of choice. Works great. How about coconut milk yogurt? I’m going to try it as I can’t do dairy myself! I’ll try to remember to update how it does! Can the dressing be made (days) in advance)? I wouldn’t make the dressing too far ahead of time because the avocado can brown. I usually try to make it the day of, a few hours would be fine though. 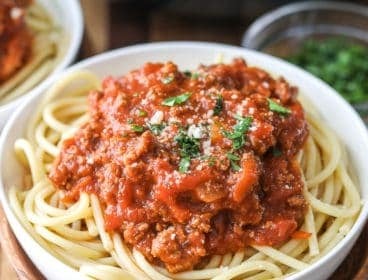 This is my favourite 15minute recipe hands down. It’s great because you can cut up regular tomatoes instead of cherry or grape, more or less of whatever kind of pasta you have in the cupboard (I use spirals or penne) depending on how many mouths you’re feeding and I add lots of baby spinach for my leafy green hit. With or without the green onion, a whole bunch of cilantro; I make it at least once a week. Thanks so much! This pasta was very interesting. The key is to allow the dressing to sit at least the one hour , like the recipe says. Time is your friend with this one. I added red onions, but they were a bit overpowering. I think radishes or sweet onion would be a good choice! 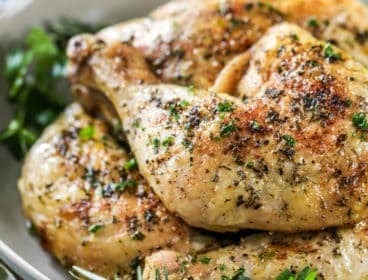 I had to add a touch more cumin and garlic powder than called for, but that is the beauty of this recipe- very easy to adjust it to your own flavor profile. I used bow tie but would have preferred the rotini! this was very fresh and tasty! Thanks for posting!!! Thank you for your feedback and your great suggestions! For my family members who don’t like cilantro, I make this with fresh parsley. It’s delicious. 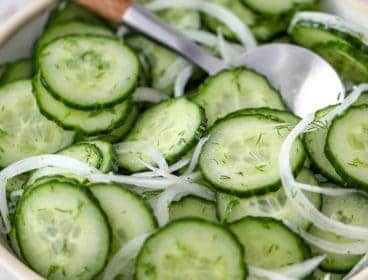 I also add diced cucumber. Great tip, thank you for sharing Betty! I noticed you said you can make this up a head of time. So there’s no issues with the avocado or the dressing turning brown? I usually make this one a few hours ahead of time and don’t have any problem with browning. I hope that helps! 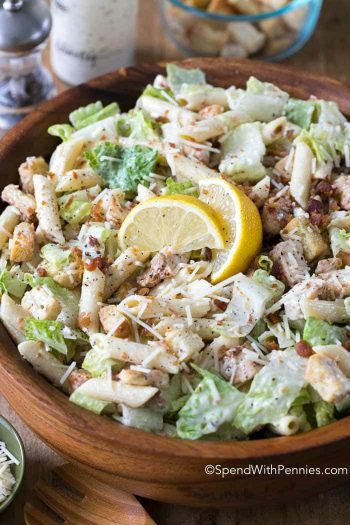 Enjoy the pasta salad, we love this one! so is it dried coriander or fresh? they are very different! 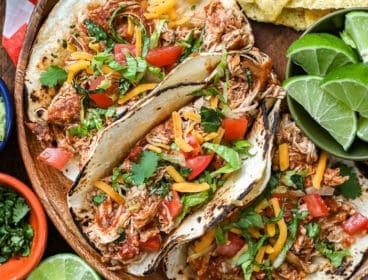 The ingredients include fresh cilantro (which Pinterest changed to coriander). Fresh cilantro is correct. It was delicious, thank you, that creamy avocado dressing is amazing! I’m so glad you loved it Melody! I agree,I could eat that dressing with a spoon! Thank you for letting me know Kate, I will definitely look into it! This recipe will make 8 servings (1/2 cup). This was a nice change to the usual salads we have at the 4th of July BBQ. I skipped the cilantro because I LOATH it. It was fine without it. Next time I might add some diced cucumber and maybe even some black beans to add layers of flavor. 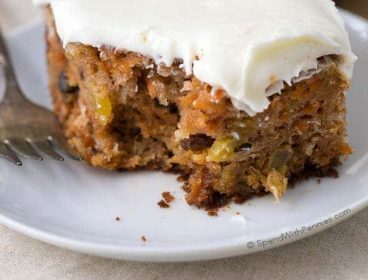 I suggest that if you plan on making this, you do so only if you can serve it within an hour or two so as it will begin to turn brown even with the lime juice. It’s really not something you bring to a potluck unless you have a short drive. It’s better suited for your own gatherings at your own home. 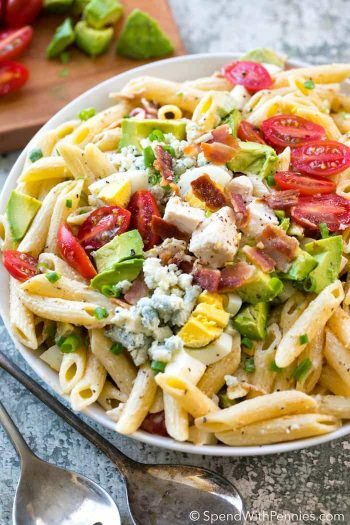 Or, make the pasta, bacon, green onion, tomato & just cut and fold in avacod when you get where you’re going & mix dressing there as well. 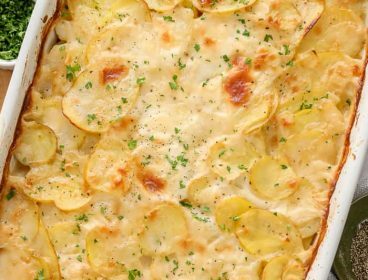 This was good and will remain in our recipe index. Thanks! Thank you for the great tips Erin!! I’m glad you enjoyed this salad! This recipe is delicious , thanks for sharing. I’m always looking for new things to try :-).